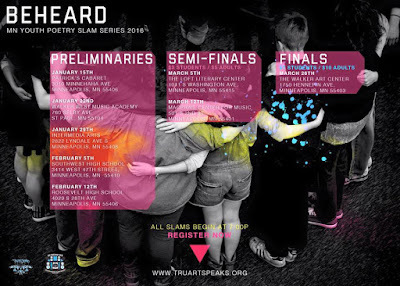 Guante: New Video for My Poem "Handshakes," the #BeHeard16 Kickoff, Plus a Brand-New Poem: "Police Make the Best Poets"
New Video for My Poem "Handshakes," the #BeHeard16 Kickoff, Plus a Brand-New Poem: "Police Make the Best Poets"
Thanks to Patrick Pegg, I finally have a really good video version of a poem that I've been performing for years now-- "Handshakes." This was shot in front of a sold-out audience at our second annual "Page.Stage.Engage" show at the U of MN's Whole Music Club. We got a ton of footage from that show-- of me, Tish Jones, and various Be Heard MN youth poets, and it'll all be posted over the next few months. I'll include the full text at the bottom of this post (something I'm going to be better about in 2016-- working on adding the text to all of my videos). It's not the deepest or most poetically challenging thing I've ever written, but it stays in my arsenal because it's an approachable entry point to some deeper discussions about identity, and because on a poetic level, it does the "talk about something big by talking about something small" thing that some of my favorite poetry does. In other poetry news, I hope everyone knows about the 2016 Be Heard MN Youth Poetry Slam Series! It really is kind of the coolest thing that happens all year in the Twin Cities, and if you haven't ever witnessed it, this year will be a great time to check it out. Prelims start in January. If you're 13-19 years old, you can actually sign up. But if you're not, I really want people to consider just showing up as audience members. These are some of the most incredible writers and performance artists in the state, youth or otherwise, and deserve your support. Finally, here's a brand new poem I wrote after the Tamir Rice grand jury decision. 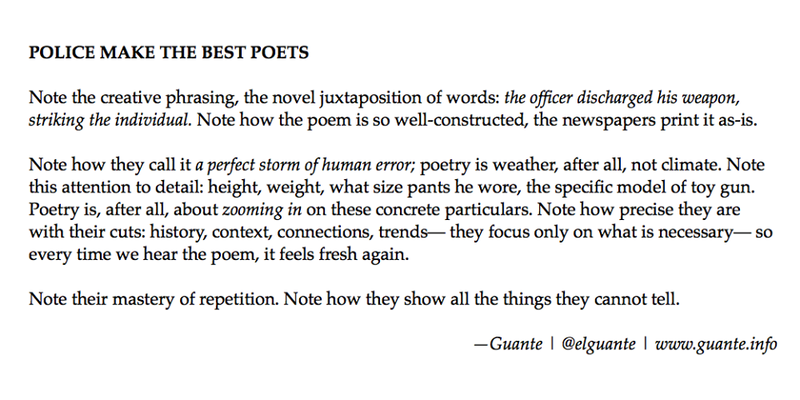 I don't often post my poetry as text, but it seemed more appropriate than video for this one. Everyone needs to know about this case, and I'd also point people toward a local connection: the MN Neighborhoods Organizing for Change anti-grand jury petition here. The ins-and-outs of the legal system aren't always the most attractive thing to talk about or organize around, but they are absolutely how racism continues to live and breathe in our communities, and knowing about them (and organizing to change them) is vital. 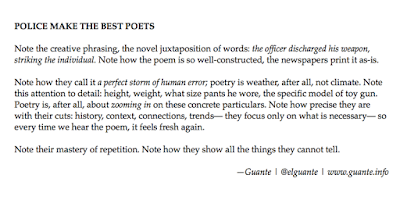 This particular poem adds a media literacy lens, critiquing how police violence is so often presented by police and media as "isolated incidents" as opposed to trends and cultures, and the impact that this has on public opinion. As always, feel free to share any or all of this with your networks. Every Facebook post, Tweet, Tumblr post, etc. is very much appreciated. Much more is on the way! Here's the full text of "Handshakes:"
The weirdest thing about having your hand crushed is that the pair of eyes across from yours never stops smiling. As knuckles are compressed, as the skin is all but torn off the top of your hand, he always has this grin on his face. Even as the vein bulges from his neck he smiles, until you grudgingly mumble, "that’s quite a handshake," and he releases you. As a young man, I was taught that one’s masculinity is tied directly to one’s handshake, that when meeting another man for the first time, no sin was more unforgivable than placing a limp fish in his hand, the dead husk of a greeting. Your grip must be firm, like the way you hold your briefcase as you walk to work, or the way you hold the handle while standing up on the bus. Some men, however, prefer a grip like a battle-axe mid swing, like ripping the head off an antelope by tugging on the antlers. Some men treat every handshake like a gladiator’s death-match, a test of strength, a test of will. And when I meet these men, as I often do, their tectonic plate handshakes never fail to illuminate my myriad inadequacies. Frozen there with purple fingertips, I am reminded that I cannot stand the taste of beer, that cars confuse and frighten me, that I don't really care about sports, that when faced with a barbeque and a pair of tongs, I will overcook the meat every time. These men attempt to squeeze the testosterone from my body. Do you ever feel trapped? In the mornings, when you’re watching SportsCenter and happily downing that protein shake made from raw eggs, liquefied steak and Axe Body Spray, do you ever crush the glass between your fingers? Do you ever get tired of the voice in your head, you know, the one that sounds like Dennis Leary, telling you to constantly reaffirm that you’re a “real man” by catcalling women, eating enormous hamburgers, and squeezing everything really, really hard? I find myself wanting to ask him: Do you hold your wife’s arm like this when you’re angry with her? Is there a teddy bear, somewhere in your history, being ripped away from a pair of hands that just aren’t strong enough? Do you remember the first time your father wouldn’t let you hold his hand when crossing the street? Do you remember the way he looked at you? Do you remember being handed your first-born son and not knowing how to hold him? Do you remember squeezing his shoulders like this the first time he disappointed you? Do you remember what it was you were trying to hold on to? And I know: there is so much space between us, as men, that sometimes we feel compelled to cram as much contact as we physically can into every touch. I know. We’ve become so comfortable with crushing, so hypnotized by our own strength, we forget: how incredible it can feel to let go.